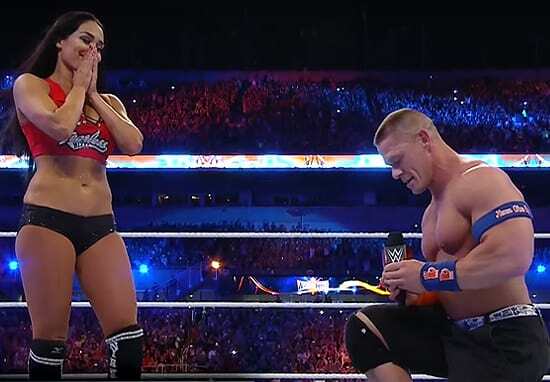 Wrestling couple John Cena and Nikki Bella broke off their six-year relationship last week, almost exactly a year after they were engaged at WrestleMania 33, and the rumour mill is going into overdrive. The he said/she said is being batted around the ring of reality much like a muscled athlete bouncing off the ropes and being pile-driven into the canvas much to the excitement of the thousands in attendance and the millions watching at home. So it’s with gripping anticipation like the sporting opera that wrestling is, I find myself on the edge of the chair to tell you what the juicy gossip is, or perhaps I’ll launch my chair across the room. Really anything can happen in wrestling and wrestling-related relationship news. The fourth wall has been smashed like a chair over a head or like the hopes of a relationship between two people and speculated on by complete strangers the world over. For a source has told a gossip site the real reason the pair split, and it turns out it was Nikki who called it a day. He was making it abundantly clear that he was going into this gritting his teeth the whole way. Nikki is an amazing, talented, strong, one-of-a-kind woman. Anyone would be lucky to have her in their life – yet John acted more and more like he was doing her a favor by somehow conceding to go ahead and marry her. Yikes, that actually sounds pretty crappy tbf. At the risk of doing a Louis Theroux and being put in my place by an offended professional wrestler, that doesn’t sound great. [Nikki] doesn’t need a pity proposal, a pity wedding, a pity husband. She’s a phenomenal, tremendous woman. Spoiler alert: I don’t personally know Nikki or John, but I do know no one deserves a pity anything; proposals, weddings or husbands especially. The latest news on the John Cena and Nikki Bella break up comes days after it was revealed he made the two-time WWE Divas champion sign a 75-page contract before the pair moved in together, making her agree to move out as soon as possible if they split. It put Nikki in the position that considered her a ‘guest’ in John’s house. In no way surprising whatsoever, People reported Nikki told her sister Brie she was uncomfortable with the agreement in their reality show Total Bellas. Better keep our noses out of their business after all.